Let us look at another of the marvels of God's creation -- the giraffe. 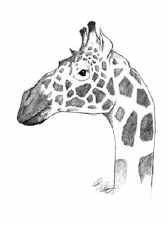 The giraffe had to be created as a fully, functional and unique animal. A mature bull giraffe grows to be about 18 feet tall. In order to pump blood up his long neck to his brain, the giraffe needs a powerful pump. His heart is about 2½ feet long. It is so powerful that, as the animal bends down to satisfy its thirst, the blood pressure is more than enough to burst the blood vessels of the brain. Evolution says something does not evolve until it is needed. But the giraffe would not know it needed to protect its brain from the devastation of excessive blood pressure until it had died of brain hemorrhage while taking a cool drink. How can it "evolve" a protective mechanism, after it knows it needs it, if it is no longer alive to do it? The giraffe has a protective mechanism which was designed by our Creator. As the bull bends his head down for a drink, valves in the arteries in its neck begin to close. Blood beyond the last valve continues moving toward the brain. But instead of passing at high speed and pressing into the brain and damaging or destroying it, that last pump is shunted under the brain into a group of vessels similar to a sponge. The brain is preserved and the powerful surge of oxygenated blood gently expands this "sponge" beneath it. However, from this mechanism another problem arises. A lion creeps up and prepares to kill its spotted prey. The giraffe quickly raises its head and, without something to compensate for the reduced blood flow, passes out. It got up too fast for the low pressure and oxygen content of the brain. The lion eats a hearty meal, and the giraffe were it alive, would realize that it had better evolve some mechanism to re-oxygenate its oxygen-deprived brain! We all know that dead animals don't evolve anything, even though evolution demands its creatures realize they need an improvement before that improvement begins to evolve. But the giraffe survives! The Creator designed it in such a way that as he begins to raise his head, the arterial valves open. The "sponge" squeezes its oxygenated blood into the brain, the veins going down the neck contain some valves which close to help level out the blood pressure, and the giraffe can quickly be erect and running without passing out and becoming lion lunch. God made the giraffe just like it is with all systems complete and ready for any emergency. There is no way the giraffe could have evolved its special features. The functional mechanisms of the giraffe demand God to be their Creator. Why not God as the Creator of everything? Everyone agrees -- a giraffe is a giraffe. It is a distinct species, a discrete entity. No one would say a giraffe is a "missing link" or a "transitional form". A giraffe is not some creature emerging from some other creature or changing into a "higher" or more complex animal -- a giraffe is a giraffe! It can be scientifically examined with results that display the necessity of a single creative act. This long-necked creature had to have been originally formed with all of its complex features fully functional. The giraffe testifies to the existence of its Creator! God in Creation by Bob Devine, Chicago: Moody Press, 1982, pp. 35-37 describes the giraffe and the necessity of a Creator. This booklet shows how ten different animals and plants demand a Creator by their special features.